A black and white negative of a cabinet card of Mary (Needham) Blow. Brian Winter took a photograph of the original cabinet card that is held in a private collection. 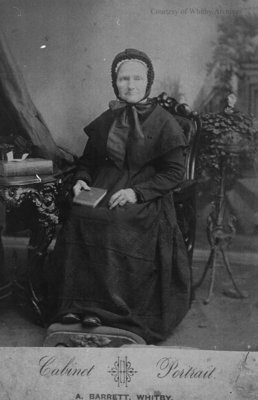 Mary (Needham) Blow (1825-1901) was born in Humberstone, Lincolnshire, England on 12 August 1825. She married John Blow on 10 February 1845 and had seven children, Martha Helen (1848-1905), Mary Alice (1851-1928), Emma, John Needham (1855-1915), Ezekiel Richard (1860-1930), Ernest Alfred (1862-1936) and Lucy. Mary died on 13 December 1901 and is buried at St. John's Anglican Cemetery, Port Whitby, Ontario. Mary (Needham) Blow, c.1880, A. Barrett. Whitby Archives A2014_005_002A.